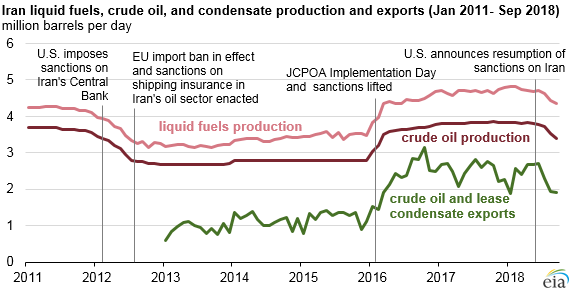 Iran's crude oil exports and production have declined since the May 2018 announcement by the United States that it would withdraw from the Joint Comprehensive Plan of Action (JCPOA) and reinstate sanctions against Iran. The announcement included two wind-down periods to allow those doing business that involved Iran time to comply. On August 6, 2018, the first wind-down period ended and triggered the re-imposition of some sanctions. On November 4, 2018, the second wind-down period will end and trigger the re-imposition of full sanctions, including a number of measures that target Iran's energy sector. According to data from ClipperData, Iran's exports of crude oil and condensate peaked in June at about 2.7 million barrels per day (b/d), more than 300,000 b/d higher than the average during the first four months of the year (before the May announcement of sanctions). In September, Iran's crude oil and condensate exports fell to 1.9 million b/d. Although some countries, such as France and South Korea, stopped importing crude oil and condensate from Iran in July, other countries continue to import from Iran. The United States has not imported crude oil and condensate from Iran in several decades. ClipperData indicates that China and India collectively received nearly half of Iran's crude oil and condensate exports in the first half of 2018. During this period, China's imports from Iran averaged 644,000 b/d and India's imports from Iran averaged 554,000 b/d. In September, China's imports from Iran dropped to 441,000 b/d, the second lowest level since December 2015, while India's imports from Iran were 576,000 b/d. In response to the announcement of sanctions by the United States, the European Union passed a statute to protect European companies doing business in Iran from the effects of U.S. sanctions. Despite this effort, data from ClipperData indicate that France has not imported any crude oil or condensate from Iran since June. In addition, Italy's and Spain's imports from Iran in September were 27,000 b/d and 15,000 b/d lower than their averages for the first half of the year. Some countries could continue to import Iran's crude oil and condensate until the November 4 deadline, at which point they might stop importing from Iran. Iran's exports have fallen at a faster rate than production. Shipping operators have decreased operations with Iran, but Iran has continued to export largely through the state-run National Iranian Tanker Company (NITC) and the Islamic Republic of Iran Shipping Lines. Trade press reports indicate that as countries continue to decrease imports from Iran, some of Iran's shipping fleet is already being used as floating storage, where crude oil is placed onto ships and stored indefinitely. Surplus crude oil production capacity in the Organization of the Petroleum Exporting Countries (OPEC) could be used to replace some of Iran's crude oil barrels that are coming off the market. Saudi Arabia's Arab Light is similar in composition to Iran Light crude oil and may provide refiners with a possible crude oil that would not require refiners to make significant alterations to their crude slates.